No wiggling out! 100% soft, comfy cotton. 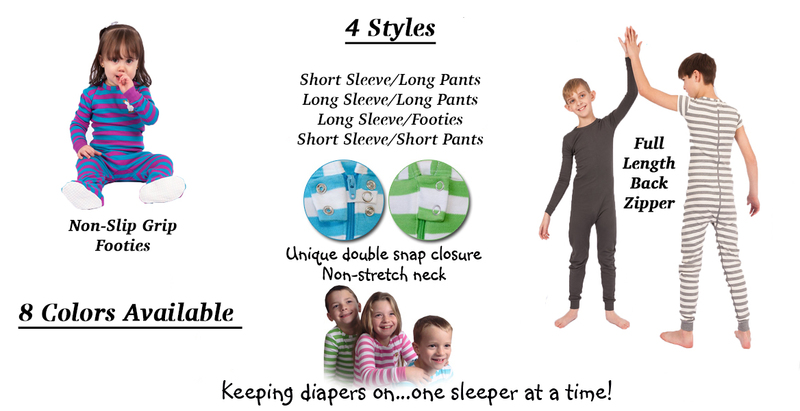 get your Little Keeper Sleeper before it’s too late! See our amazing testimonials like this! Already back for more! They are working:) This is now the twins official uniform. Glad you make these in larger sizes. I am sure I will be using them for a long time. Thank you. These are awesome!!! My son was pulling out his G-tube in the middle of the night, but not once since I found Little Keeper Sleepers! THANK YOU!!! You guys make the greatest pj’s in the world! You’re awesome & we wouldn’t make it without you. Thank you! These pj’s have solved our problem with 2 year old twins, our daughter’s babies. Thanks for a great product! I’ve ordered these AMAZING pajamas in the past & must tell you how much they have changed mornings in our home. It’s nice to not wake up to a mess every day!! Thanks very much for these!! I received my order from last week and was able to wash it/try it on. She is currently sleeping in it now and for the first time in over two weeks – did not remove it at all!! Very excited to have found you and your product – thank you!!! Thank you so much for your help! My son has cerebral palsy and learning disabilities…this is the first pj we’ve been able to use with him that he will sleep comfortably and not get his diaper off. Thank you so much for making these pajamas. I ordered 1 a few weeks ago to try it out. She can not escape them. Ha! Today, I will be ordering 3 more. In the past I never knew what I would find when she woke up in the morning. Thanks again. Love the new colors! We tried to do the backward pjs again and we were thwarted by our lovely 4 1/2 year old! Thx you! This mother with a child with autism thanks you! Thank you for the very prompt delivery of sleepovers. They are fab. I was a little worried about ordering as I am in UK everything was straight forward on ordering and I would not hesitate to order this fabulous product again thank you very much . This is my second order. I can’t believe that he can NOT get out of this PJ. This has completely changed our lives. Also, he wants to wear them, I guess it feels like deep pressure. Now all I need is shoes!! Thanks so much! I got these sleepers for my son and so far it has been a Godsend. Two days in a row, I have not had to wash sheets two and three times a day. I am so glad you developed this product. Your pajamas are great and a godsend! Loved the long sleeve/footie PJ’s so much I’m back for the summer version! Saved us!!! I still use LKS daily for my daughter and love them! We even have a #LKSgangWorldwide hashtag!! Lots of Aussie & UK friends love them, thanks to my pledging of love to your fabulous sleeper! Thank you for an outstanding product and great customer service. Thank you for your product – it has saved me hours of sanitizing and cleaning my daughter’s crib. I am very impressed with the quick service and would like to thank you all for the great service! The Little Keeper Sleepers have been a lifesaver. My daughter has special needs and these pjs help soothe and calm her. She is finally sleeping soundly. Her diaper stays on and I no longer have to wash her sheets and blankets every day! Can’t thank you enough. Hi, I just wanted to say thank you so much for making these. Our 3 year old Autistic child is using these so that he can’t “dismantle” everything he is wearing when we put him down to sleep. We all can finally get some rest! These things are the BEST! They’ve brought some harmony back into my home and helped me to see how sweet and cute my son can be- instead of being so angry about the nasty messes he was making. Thanks so much!!! I am a mom of six and I recently tried the Little Keeper Sleeper® on my two year old twins who are constantly taking off their pajamas and clothes. The Little Keeper Sleeper® worked great, neither of them could take it off. It’s warm, cozy and I would use it daily. A little while back I purchased 2 Little Keeper Sleepers. I have to first tell you that they have been a god send. My autistic son had been taking his pajamas off several times during the night, and he has not once, taken these sleepers off. Thank you so much. These outfits have been a huge success! Thanks! These are LIFESAVERS!!! Thank you for developing this product. It is the ONLY sleeper my autistic grandson cannot get out of. THANK YOU for making our lives a little bit easier!! Just wanted to say thank you soooo much for your wonderful customer service and gorgeous suits! They have our poo painter under control and she looks so cute at the same time. I have a major soft spot for onesies! Thanks Again. Thank you! Such a well-made product, much better than one of your competitors and it fits more true to size. Love them! Thank you for all your help!! You provided the best and most responsive customer service I have ever received – probably because you’re a mom and know how frustrating bad service can be. Thank you. I will continue to highly recommend your products to all my friends! We love these jammies — they are the best!! We love your jammies! It’s so wonderful to be able to put our son down to sleep and not fear what we find when we get him up. Thank you for a great product that REALLY works! Hi, I’m beyond thrilled with your product. I’ve bought them countless times. My son is 6yrs old with Autism so you can imagine why we love them so much. This is the third time I’ve ordered from LKS and not only is the product fantastic, the service is always exceptional! I ordered 3, 4T Sleepers for my son and they have been heaven sent. I just really can’t tell you how much I appreciate these sleepers. These are the best outfits i’ve ever bought for my daughter she has GDD and Autism and now can’t remove her diapers in the night. Thank you guys….we shipped them over to England from your website. A few months ago we bought some of your sleepers in Size 18. We absolutely LOVE them! I just wanted to say how much we like your product. and that we would like to see you expand your Footed Sleeper lines to include the size 18’s. They are a god send! Thanks! Fantastic fit, and does the trick! I am now able to breathe a bit easier when my daughter is alone in her crib during naptimes and bedtimes. She also loves the little bear on the front. Hi, We have ordered from you twice and we love your sleepers! My son will actually keep his clothes on at night and we have had less head aches. This is the second sleeper I’ve ordered for my granddaughter. It is a Godsend! Hi there! I recently bought my son a long sleeved sleeper and it is awesome! Such a joy to finally have a solution to diaper finger painting. My little Houdini has not figured out how to escape this! Go ahead! Pull, tug and twist! The Zip Bib isn’t going anywhere! * Soft, durable, cut & comfy! * Messy eaters stay clean! * Perfect solution for droolers! * Great gifts for baby showers, holidays and birthdays! Even a little Houdini could not get out of this!